PNY BD7800 7800mAh 1 / 2.4 Amp PowerPack - Universal Portable Rechargeable Battery Charger for Apple iPhone /iPad, Samsung Galaxy/Note/Tab, Nexus, HTC, Motorola, LG, BlackBerry, and other Android Smartphones & Tablets by PNY at Got Busted Mobile. MPN: P-B-7800-12-S01-RB. Hurry! Limited time offer. Offer valid only while supplies last. The PNY 7800 PowerPack is a dual-port 1-Amp + 2.4-AMP Universal Rechargeable Battery designed to provide you power wherever or whenever you need it. The PNY 7800 PowerPack is a dual-port 1-Amp + 2.4-AMP Universal Rechargeable Battery designed to provide you power wherever or whenever you need it. 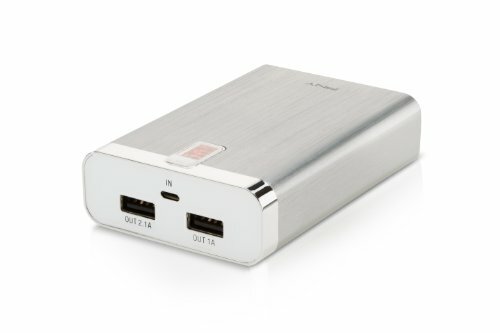 A fully charged 5200 PowerPack can recharge most smartphones up to three times. Ideal for charging two devices simultaneously. Works with Apple, Android, Windows, and BlackBerry devices. Includes a 20 Micro USB cable for charging the PowerPack as well as Micro USB devices. STAY CHARGED: Provides up to 5 charges for your mobile device when you need it most!